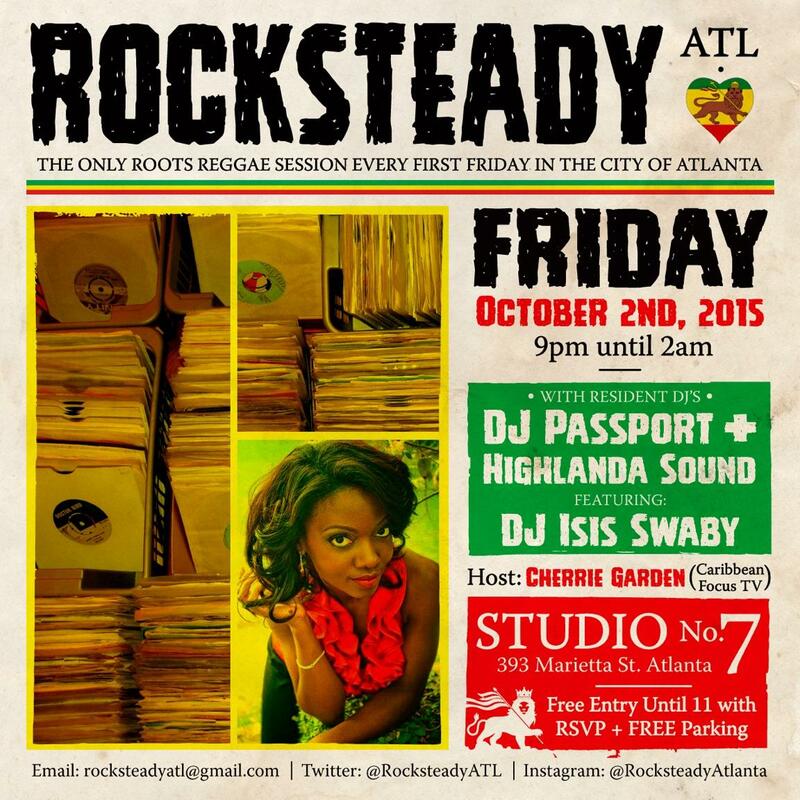 Rocksteady ATL, the roots reggae event held regularly in the city of Atlanta, is now celebrated on the first Friday of each month inside Studio No 7, at 393 Marietta Street in Atlanta, Georgia 30313. Friday October 2nd will be hosted by Cherrie Garden, host of Caribbean Focus TV, Emcee, Actress, Dancer & Miss Jamaica World 2012 Semi-Finalist. Our special guest DJ will be Rockers International representative out of NYC, Empress Isis Swaby, visual artist, DJ/producer and daughter of famed reggae icon Horace “Augustus Pablo” Swaby. Resident selectors Kahlil Wonda of Highlanda Sound and DJ Passport bolster the event line-up, but there will be surprise performers in addition. 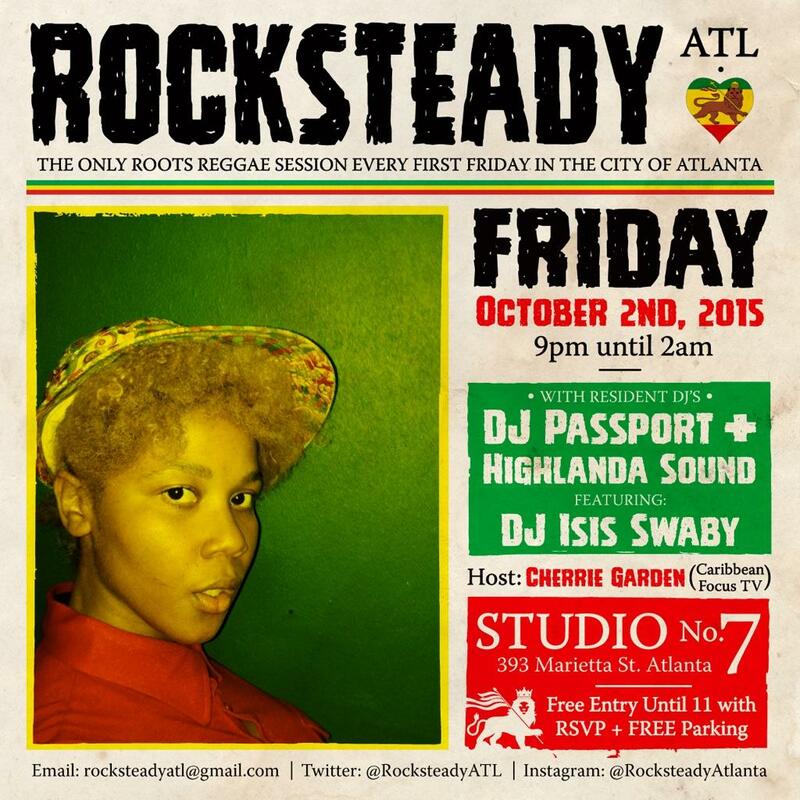 Rocksteady ATL has developed a strong reputation as an original old-school reggae soiree powered by some of the best reggae roots acts in the South and internationally. On a monthly basis guests enjoy world-class mixology along with critically acclaimed music in the same unique tradition that nightlife enthusiasts simply can’t find at any other spot in the city. There is a $5 cover charge, with guests who RSVP admitted free until 11pm. For more information about #RocksteadyATL, contact 404-552-0492 or email rocksteadyatl@gmail.com.